How eager are you to get that fashionably well-dressed look and make all of your co-workers turn their head as you walk to your office? The answer is, very, we assume. Then take a look at this first-rate, chic set of cufflinks and you will see that you won’t have to put that much effort into doing so. The fiber optic glass carefully used by our craftsmen give this pair a wonderful aura of mystery, as its hues change when viewed from different angles. 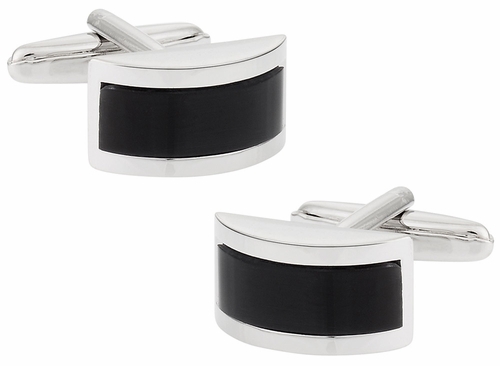 The elegant combination of colours – black and silver, and the simple design make this rhodium-plated silver cufflink the piece that must be included in your collection. These cufflinks have a eye catching high contrast design that catches the light well and matches many outfits perfectly.